The first E-GEM workshop took place last July in Québec, bringing together the first line of potential users of the GNSS-R Earth Observation data products, as well as technology developers and other interested parties. It provided an opportunity for E-GEM and other related projects - such as ESA’s GEROS, NASA’s CYGNSS and UKNA’s TechDemoSat - to identify and explore potential synergies, and to better understand the users requirements on GNSS-R generated data. You can find more information on the workshop and download the presentation slides at the workshop website. 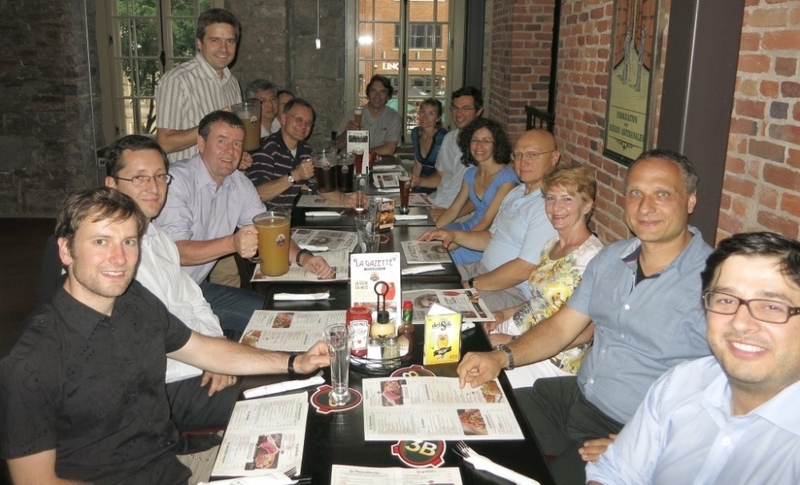 After a hard day's work at the workshop, and a full week at IGARSS'14, there was still time for a few beers over dinner for some of us. Left to right around the table: Max Semmling (GFZ), Adriano Camps (UPC), Jens Wickert (GFZ), Martin Unwin (SSTL), Chris Ruf (Univ. Michigan), Ed Kim (NASA Goddard), Toni Broquetas (UPC), Ad Stoffelen (KNMI), Estel Cardellach (CSIC-ICE), Antonio Gutiérrez (DEIMOS), Maria-Paola Clarizia (Univ. Michigan/NOC), Valery Zavorotny and wife (NOAA), Achim Helm (Astrium A&D), Nuno Catarino (DEIMOS).